This offer is for an extensive dental examination with the dentist. We will listen carefully to all that you have to say, as we believe that this is essential to forming a correct diagnosis and to making an appropriate plan of action. Therefore, the appointment will typically last 40 minutes, or 60 with hygiene included. Please visit us, telephone the practice or e-mail to arrange your visit. New patient appointment just for Hygiene: £100. This is suitable if you are in Oxford for a short time; it does not include an assessment. 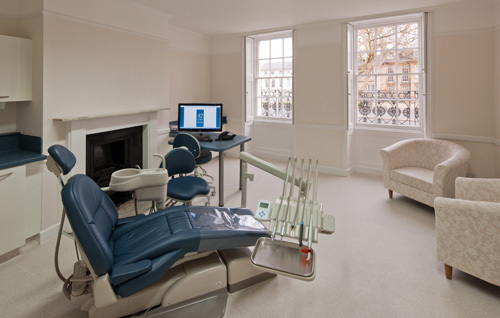 Our completely refurbished listed building welcomes you to a dental practice that provides care for you, your friends and family. The dentists each have over 20 years’ experience in hospital dentistry and general practice, find out more here. Our aim is to look after you to a very high standard in a comfortable and friendly environment. 42 St Giles' Dentists is fully computerised with digital x-rays for improved quality and safety and speed; has the latest equipment and magnification for high quality dentistry; and cleaning and decontamination facilities that are well beyond minimum requirements. We are members of Denplan, are CQC registered for all aspects of dental care and are regulated by the GDC. C.S.Lewis and Joy Davidman were married at 42 St Giles' in 1956.